NCTE/IRA Standard 1: Students read a wide range of print and non-print texts to build an understanding of texts, of themselves, and of the cultures of the United States and the world; to acquire new information; to respond to the needs and demands of society and the workplace; and for personal fulfillment. Among these texts are fiction and nonfiction, classic and contemporary works. NCTE/IRA Standard 3: Students apply a wide range of strategies to comprehend, interpret, evaluate, and appreciate texts. They draw on their prior experience, their interactions with other readers and writers, their knowledge of word meaning and of other texts, their word identification strategies, and their understanding of textual features (e.g., sound-letter correspondence, sentence structure, context, graphics). Creating a literary mixtape would require students to think about the character and his/her conflicts and development as well as the plot and theme of the work in which the character appears. The mixtape could be a fun strategy for helping students comprehend, interpret, and evaluate texts and enables them to draw on their prior experience with music to make meaning of the texts they read. Students should either pick or be assigned a character or work of literature. Students pick ten songs that somehow illustrate the work’s theme or define that character. Students can also pick songs that would appeal to their character. Students write a two-three sentence justification for their song selections. Their justification should explain why the song fits the character or work. Optional: students can present their mixtapes. Optional: students can design a cover for their mixtape. Take a look at these other Flavorwire mixtapes. At an NCTE conference in 1997, I went to a session that shared a strategy similar to this, and the teachers in that session shared that students had paired “Uninvited” by Alanis Morissette with The Great Gatsby and “Head Like a Hole” by Nine Inch Nails with Heart of Darkness. I thought those examples were good, as the speaker in “Univited” is addressing a suitor she isn’t interested in and explores the uneven nature of their feelings for each other, while the speaker in “Head Like a Hole” repeats the refrain, “Bow down before the one you serve. You’re going to get what you deserve.” The last line of the song, “You know what you are,” echoes the end of Heart of Darkness: “The horror”—Kurtz’s last words as he realizes who he is. Be mindful of copyright. Do not ask students to assemble actual tapes or CD’s. Students might be able to find officially released videos on YouTube or the artists’ websites, but they should not try to circumvent copyright laws in order to share the music they assemble. Several online services allow users to stream selected songs and create playlists (Spotify, for example). This assignment could also work for historical figures or biblical characters. 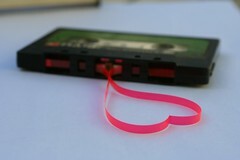 Update, 1/10/12, 8:45 A.M.: Check out Leslie Healey’s post about creating a mixtape for King Lear. Note: she shares Playlist.com as a way to create mixtapes. What great timing! I am doing Macbeth right now, and I am beginning literature circles too. This sounds like a perfect aspect to add. Thanks! Check out the Lady Macbeth mixtape from Flavorwire. It would be a fun piece for literature circles.